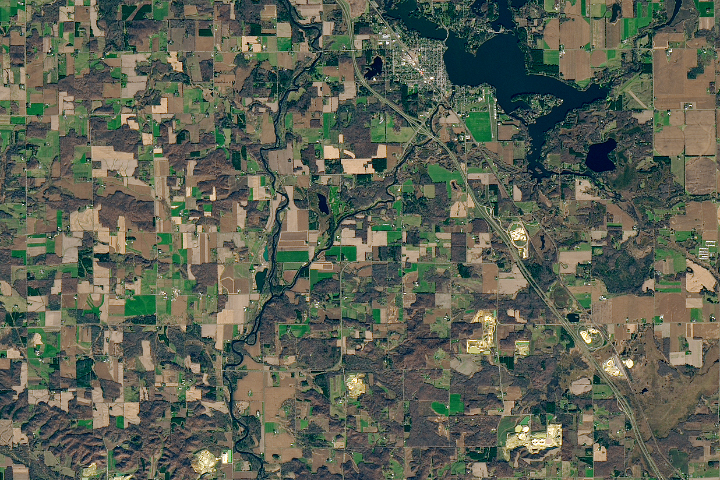 The Sand Hills cover about a quarter of the U.S. Great Plains state Nebraska. 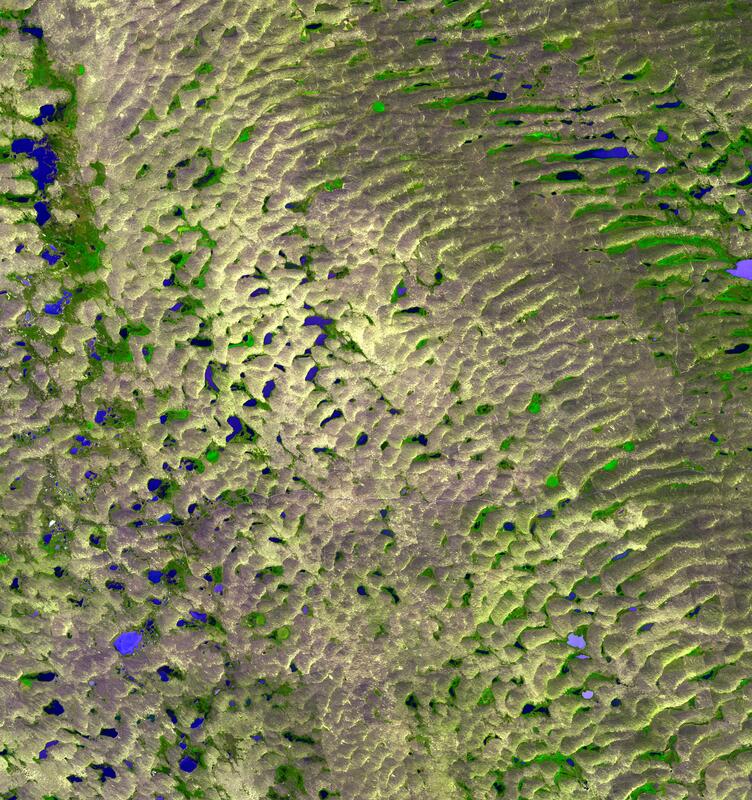 These ancient sand dunes are from the Pleistocene Epoch (the geologic time period spanning about 1.8 to about 10,000 years ago). They are made of sediment eroded from the Rocky Mountains by the monumental Pleistocene glaciers, washed out into the plains, and now mostly stabilized by grassland vegetation. Covering an area of about 60,000 square kilometers in western Nebraska, the Sand Hills are the largest sand dune formation in America. 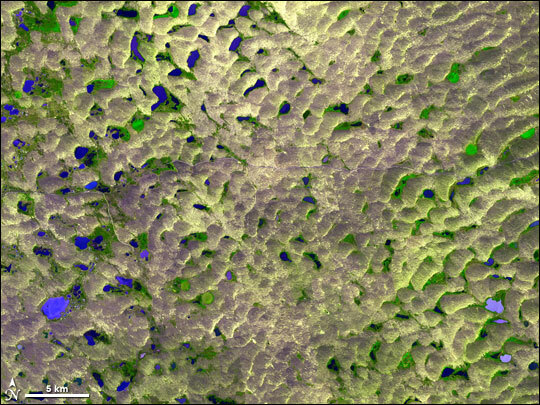 This simulated natural-color image from the Advanced Spaceborne Thermal Emission and Reflection Radiometer (ASTER) on NASA’s Terra satellite shows a portion of the Sand Hills region, the landscape rippled by crowded yellow-tan and lavender-brown dunes. The area doesn’t drain water very well, and so the hollows at the bases of dunes are filled with brilliantly blue lakes. 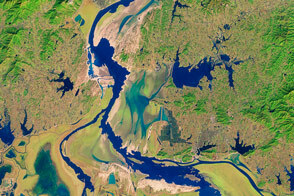 In the large image it is easy to see that some of the emerald green vegetation is being cultivated, rather than growing naturally. Perfect circles of vegetation resulting from center-pivot irrigation appear in the scene, as well as fields with sharp angles and straight lines. According to a report on the Sand Hills by the World Wildlife Fund, the soils of the Sand Hills aren’t like any other soils in the Great Plains, and unique grasses and plants live there. The sandy soils were not attractive to farmers, and so the area was left largely unplowed by European settlers. As such, the area is one of the least disturbed remnants of the vast prairies that once filled the central United States. The area is an important habitat for migratory birds, such as the sandhill crane, one of only two species of crane native to North America. This ASTER image was acquired September 10, 2001, and the large image covers an area of about 57.9 by 61.6 kilometers. It is centered near 42.1 degrees North latitude, 102.2 degrees West longitude.